-- Select a Size/Color -- Medium - Out of Stock! Large - Out of Stock! 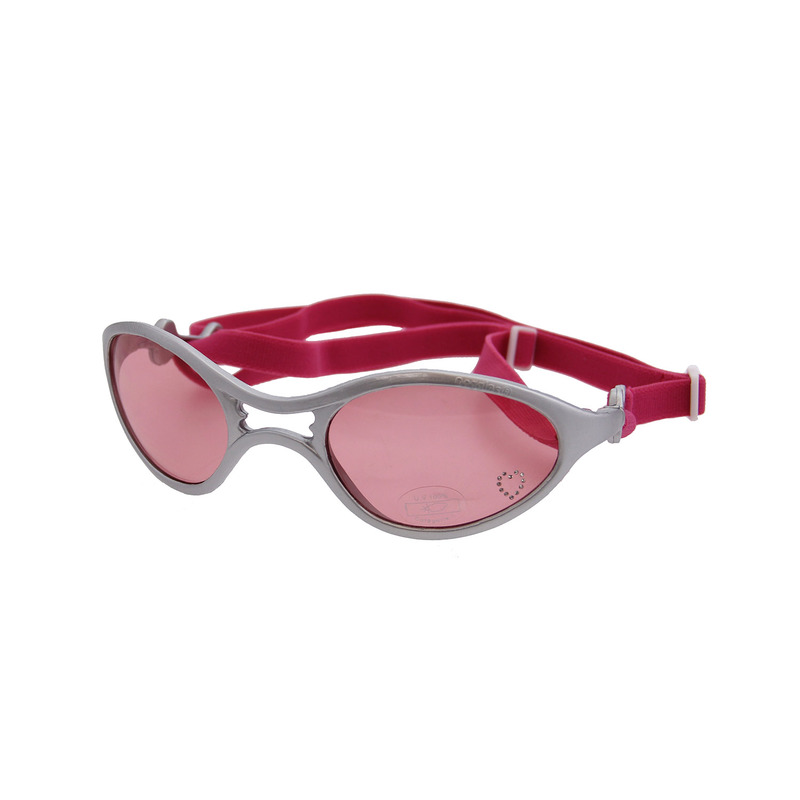 K9 Optix dog sunglasses offer 100% UV protection and shatterproof polycarbonate lenses. These glasses have a rubber frame in silver. No more screws at the nose bridge, no more hard frames. The sunglasses are great for dogs with wider nose bridges! Trying to stay cool this Summer? Our K9 Optix are so hot that they will make any canine companion look cool! So super stylish you might just want to keep them for yourself. They are the essential accessory for every fashionable canine! With stylish designs, there's one for every occasion or outfit. Plus, the K9 Optix line is great for dogs with wider nose bridges! Measure from the outside corner of one eye, around the back of the head (under the ears) to the outside corner of the other eye. That is the head strap measurement. For chin strap, measure from the outside corner of one eye, around the chin, and to the outside corner of the other eye. 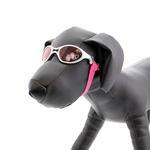 Doggles - K9 Optix Rubber Sunglasses for Dogs - Silver with Pink Lens Customer Photos - Send us your photo! Gaby is the Coolest Dog ever, and where EVER she goes, people stop to take her picture, ALL the time! She is a loving, fun, Diva! And advocates for homeless dogs everywhere! Sophii loves soaking up the warmth and the sunglasses protect her eyes from the glare. Mikey is a long hair Chihuahua with a personality larger than Life !!! He loves children, does a lot of tricks and enjoys learning He is working on getting his Canine Great Citizen certification so he can volunteer in our local Children Hospital with terminally ill children. Mikey Loves His Doggles !!! My little teacup Aussie loves her glasses. We have 2 sizes as the first were a bit big on her but she loves them both. They really help her when she's out I. The sun! Phoebe is learning to LOVE her new Doggles! Thanks Baxterboo! She is fully grown at 3 lbs 5oz. We just bought a motorcycle and plan to take her with us on trips and wanted to be sure she is fully protected. Much to our surprise and happiness she loves these sun glasses. Needless to say she is the princess. 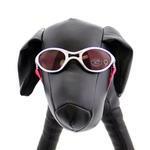 Isabella is ready for summer in her diva Doggles! She will be the cutest dog on the lake! Carlee loves going for a ride! Elvis has left the building, and Mazzy is taking over! Posted On 06/21/17 by Dawn M from New Ipswich, NH Yes, Dawn M recommends this product! Posted On 06/11/17 by Jennifer L from West Haven , CT Yes, Jennifer L recommends this product! Great glasses, they look and fit great on my Chihuahua! Posted On 05/16/17 by Susanna D from Arroyo Grande, CA Yes, Susanna D recommends this product! It's very cute but it's to wide for my toy poodles face. And I got the smallest size. Darn. Posted On 04/13/17 by Pat H from St. Petersburg, FL Yes, Pat H recommends this product! I love these glasses. I can feel comfortable letting my dog put her head out of the window knowing she won't get anything in her eyes. I also like the 100% UV Block. It's important for dogs eye health. Posted On 02/28/17 by Cindy S from Racine, WI Yes, Cindy S recommends this product! I purchased theses sunglasses because Paris is very easy going. She really likes wearing the visors she has. And our Veterinarian said that is great. It will help her from developing eye problems. Since she is so EZ going I decided to take a chance. Now she has eye protection from the sun and bugs when she sits in her little basket on the front of our bicycles. Can't wait to see our vet in May to let her show his whole office her new shades. She just wears them. No fuss trying to get them off. Because she is so tinny I did cut 2" off of each support band and re-sew it back together. You can sew by hand or machine I choose sewing machine just used a zipper foot so I could get nice and close to the bracket so. The goal was to achieve a good comfortable fit for her. So she would want to wear them. We Love em! Glad I took the chance.?? Posted On 02/01/17 by Kelley F from Iowa City, IA Yes, Kelley F recommends this product! We have 3 4lb Chihuahuas and now have 2 of the pink pairs and finally this one in XXS. Was so excited to catch this pair in stock in that size! These are so great for road trips with the girls! Posted On 10/08/16 by Tyra S from San Antonio. , TX Yes, Tyra S recommends this product! Posted On 09/01/16 by Candy R from Acme, WA Yes, Candy R recommends this product! These are so cute. Lucy had eye surgery, and we're using them for eye protection. Also did I say she looks so cute in them. Posted On 08/17/15 by POODLEMAMA from Rochester, NY Yes, POODLEMAMA recommends this product! 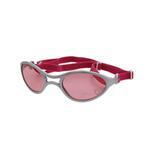 If you want your pooch to view the world through rose colored glasses....these are a must!!!! Posted On 05/08/15 by Kathryn R from Bay St Louis, MS Yes, Kathryn R recommends this product! Posted On 11/14/13 by Donna Lee A from Oak Lawn, IL Yes, Donna Lee A recommends this product! Posted On 11/08/13 by Celeste G from Aiea, HI Yes, Celeste G recommends this product! I have a Pomeranian Chihuahua and nearly every day when we go out, I put her glasses on and she loves it! Not only is it stylish but safe for her to wear to keep debris from flying into her eyes while I drive since she loves to stick her head out of the window like most dogs do. There is ALWAYS dust & dirt on them so I can imagine how great it is to not have that in her eyes. So many compliments too and people asking where to get them. She adjusted to them quickly and even posed when my friends took pictures. Too cool! Posted On 11/07/13 by Donna Lee A from Oak Lawn, IL Yes, Donna Lee A recommends this product! I bought these glasses for my 6lb Chihuahua, "Little Pig" aka Danica, as soon as I seen them. From my end, they're easy to put on, they stay in place, protect her eyes and appear to be comfortable for my " Lil Piggy." As for her opinion of them, all I can say is that she has no problem with wearing them for extended periods of time. In addition, she seems very proud of them as when she is wearing them, she makes it a point to stand up in her seat at stop lights/signs and show off her glamorous look to anyone that will look her way; head held high, proud...maybe even a bit of a show off. I would definitely recommend these to others if they have pups that will tolerate wearing them.We get so many compliments and comments.We love them and they are a real fashion statement! Wide, wide range of product. Prices pretty standard unless there is a special sale or free shipping.